Predictions and maps for the solar and lunar eclipses are presented in a number of figures linked to this document. World maps show the regions of visibility for each eclipse. The lunar eclipse diagrams also include the path of the Moon through Earth's shadows. Contact times for each principal phase are tabulated along with the magnitudes and geocentric coordinates of the Sun and Moon at greatest eclipse. Although all three lunar eclipses are "visible" from parts of North America, their penumbral nature makes them difficult to detect. On Thursday, 1998 February 26, a total eclipse of the Sun will be visible from within a narrow corridor which traverses the Western Hemisphere. The path of the Moon's umbral shadow begins in the Pacific, continues through northern South America and the Caribbean Sea (Figure 2), and ends at sunset off the Atlantic coast of Africa. A partial eclipse will be seen within the much broader path of the Moon's penumbral shadow, which includes parts of the United States and eastern Canada, Mexico, Central America and the northern half of South America (Figure 1). The Moon's umbral shadow first touches down on Earth just south of the equator in the Pacific Ocean about 3000 kilometers southeast of the Hawaiian Islands (15:46:45 UT). Even at this extreme position, the total eclipse lasts nearly one and a half minutes. First landfall occurs shortly after crossing north of the equator (16:56 UT) as the shadow engulfs several members of the Galápagos Islands. The eclipse takes place shortly before noon with the Sun 69° above the horizon. Unfortunately, none of the islands are on the centre line where the duration of totality is one second under four minutes. The northern third of Isla Isabela lies within the path and experiences a duration of 3 minutes 21 seconds along its north coast. Isla Pinta and Isla Marchena are also situated in the path, but all three islands are uninhabited wildlife sanctuaries with access strictly controlled by the Ecuadorian government. After leaving the Galápagos, the umbral path continues on a northeastern course. The instant of greatest eclipse1 occurs at 17:28:23.2 UT about 600 kilometers west of Colombia's Pacific coast. At that moment, the length of totality reaches its maximum duration of 4 minutes 8 seconds, the Sun's altitude is 76°, the path width is 151 kilometers and the umbra's velocity is 0.592 km/s. The axis of the Moon's shadow passes closest to the centre of Earth (gamma2 =0.239) at greatest eclipse. Fifteen minutes later (17:43 UT), the umbral shadow enters South America and follows the border between Panama and Colombia. Stretching across the Isthmus of Panama, the path crosses into northern Colombia where the centre line duration drops below four minutes. In spite of a 25 second penalty for its position 20 kilometers north of the centre line, the Colombian city of Valledupar still experiences a generous 3 minute 29 second total eclipse. After climbing the Andes, the path sweeps through northwestern Venezuela. The semi-desert vegetation of this region is a testament to its arid climate. Although Maracaibo lies 50 kilometers south of the centre line, it manages to enjoy nearly three minutes of totality. The eclipse occurs here in the early afternoon with the Sun 65° above the horizon. The Moon's shadow leaves Venezuela via the Peninsula de Paraguan‡ and sweeps across the Caribbean where it encounters five major islands of the Lesser Antilles. The centre line passes directly between Aruba and Curaçao, but both islands experience as much as 3 1/2 out of a possible 3 3/4 minutes of totality. Aruba's capital Oranjestad witnesses a 3 minute 6 second total phase while the duration in Willemstad, Curaçao is 1 minute 58 seconds. Both islands make good locations for the eclipse since they share similarly promising weather prospects. Nearby Bonaire is just outside the 143 kilometer wide path although its northwestern coast will witness a grazing eclipse with perhaps a dozen seconds of totality. The track continues across the Caribbean where it engulfs the Leeward Islands of Montserrat, Antigua and Guadeloupe. Here, the umbra's velocity increases to over 0.9 km/s and the path width drops to 136 kilometers. Occurring in mid afternoon, the Sun's altitude is 49° at maximum eclipse. Although the centre line passes between Guadeloupe and the other two islands, all locales enjoy as much as 3 out of a possible 3 1/4 minutes of totality. Since the southern extremes of Guadeloupe actually lie outside the umbral path, most observers will want to position themselves on the north and west coasts in order to experience the maximum duration possible. Nevertheless, some may choose a site several kilometers inside the southern limit in order to witness the prolonged views of Baily's Beads and chromosphere afforded by such locations. While not quite as promising as Aruba and Curaçao, the weather prospects of this region are still quite favorable. Leaving the Caribbean Sea, the umbra races across the Atlantic towards Africa. About 1000 kilometers west of Morocco, the path ends along the sunset terminator as the shadow falls back into space (19:09:57 UT). Over course of 3 hours and 23 minutes, the Moon's umbra travels along an approximately 14000 kilometer long path and covers a region comprising 0.3% of Earth's surface. Path coordinates and centre line circumstances are presented in Table 1. Given the ground track for this eclipse, it couldn't occur during a better time of year. Weather in the Galápagos is controlled by the winds and ocean currents which are strongly affected by the Intertropical Convergence Zone (ICZ) passing just north of the archipelago. Although February is one of the Galápagos' wettest seasons, it's also one of the sunniest. The seeming contradiction is resolved by the nature of the clouds which are convective and produce brief periods of heavy showers followed by longer intervals of abundant sunshine. Statistics at Puerto Baquerizo show that it receives 63% of the maximum possible sunshine. Most South American locations are experiencing their dry season and offer good prospects for clear sky viewing. The northern coast of Venezuela and the islands of Aruba and Curaçao are particularly favorable. Sunshine statistics for the region give values of 70 to 80 percent or more of the maximum possible. Further down the track, sunshine statistics drop slightly to about 2/3 in the Leeward Islands of Guadeloupe, Antigua and Montserrat. Considering the time of year and location, many of the cruise ships that frequent the Caribbean will be put into service as floating eclipse platforms. They offer a very attractive way to view the eclipse and usually include astronomy-enrichment lectures to enhance the experience. Ship mobility and current weather data could increase the chance of viewing the eclipse to near certainty. The downside of cruising is that ocean stability will limit high-magnification photography. Still, most shipboard observers will be using modest equipment that should yield a satisfactory memento of the event. Local circumstances for cities throughout the path are given in Table 2. All times are given in Universal Time. The Sun's altitude and azimuth, the eclipse magnitude and obscuration are all given at the instant of maximum eclipse. Additional information is available at a special 1998 total solar eclipse web site. The most detailed predictions are available in the on-line document NASA RP 1383 - Total Solar Eclipse of 1998 February 26 [Espenak and Anderson, 1996]. This report is also available in hard copy form (see: NASA Solar Eclipse Bulletins). The appearance of the eclipse at maximum phase for a number of locations is depicted in What Will The Eclipse Look Like? 1The instant of greatest eclipse occurs when the distance between the Moon's shadow axis and Earth's geocenter reaches a minimum. Although greatest eclipse differs slightly from the instants of greatest magnitude and greatest duration (for total eclipses), the differences are usually quite small. 2Minimum distance of the Moon's shadow axis from Earth's center in units of equatorial Earth radii. 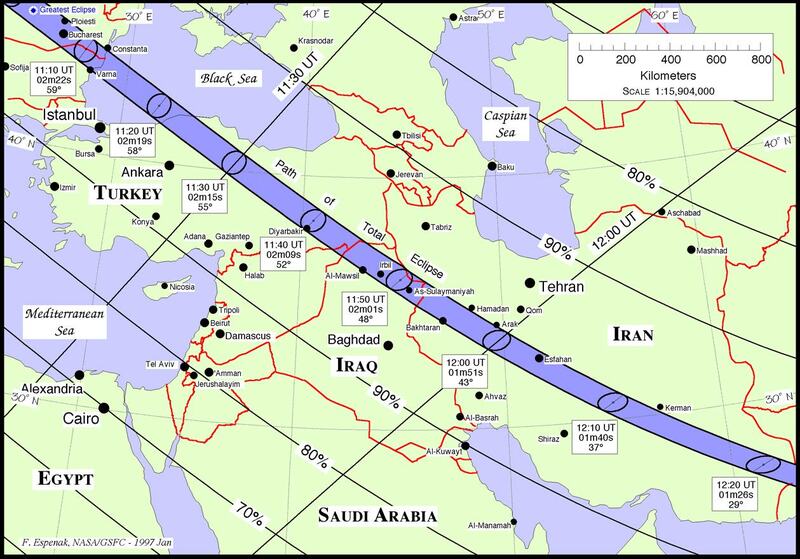 A diagram illustrating the Moon's path through the penumbra as well as a map showing worldwide visibility of the event is available. The annular eclipse of 1998 August 22 is the second and last solar eclipse of the year. Its partial phases are visible from southeast Asia, Indonesia, Australia, and New Zealand (Figure 3). 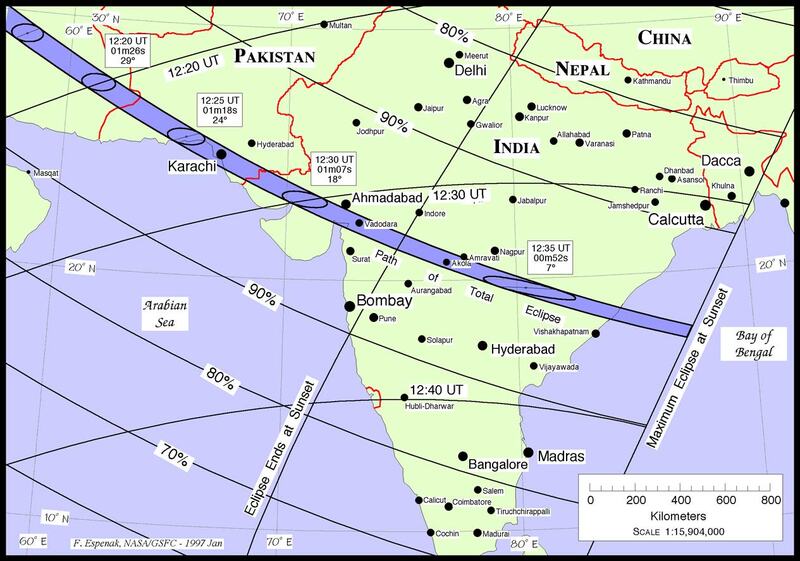 The path of annularity begins in the Indian Ocean about 1500 kilometers west of Sumatra at 00:14:15 UT. Five minutes later, the antumbral shadow reaches Sumatra and cuts a 136 kilometer path across the northern end of the island. The centre line duration of annularity is 2 minutes 50 seconds with the early morning Sun standing 16° above the eastern horizon (Figure 4). As the shadow crosses the Strait of Malacca, it engulfs southernmost Malaysia. The annular phase has a magnitude of 0.963 and the obscuration is 0.928. Just south of the path, Singapore sees a partial eclipse of magnitude 0.951. Sweeping over the South China Sea, the next major landfall occurs in Sarawak and Borneo. The Sun's altitude climbs to 37° and the annular duration approaches three minutes as the antumbra enters the Celebes Sea. The path passes just north of Papua/New Guinea where greatest eclipse occurs at 02:06:07 UT. Here, the annular phase reaches its maximum duration of 3 minutes 14 seconds with a magnitude of 0.973 and an obscuration of 0.947. Ten minutes later, the shadow's 99 kilometer wide path bisects the island of New Britain. The duration of annularity begins to drop as the path continues across the Coral Sea (Figure 5). At 3:20 UT, the antumbra makes its last major landfall as it sweeps over several islands of the New Hebrides (i.e.- Espiritu Santo, Malekula and Amrim). The centre line duration is then 3 minutes 4 seconds and the Sun's altitude is 46°. The path passes about 250 kilometers south of Fiji and ends in the South Pacific at 03:57:56 UT. The length of the entire path is approximately 13,500 kilometers which encompasses about 0.36% of Earth's total surface area. Path coordinates and centre line circumstances are presented in Table 3. During recent annular eclipses in 1994 and 1995, amateur astronomers have demonstrated that it is possible to photograph prominences and the innermost corona. These features are visible along the dark limb opposite the brilliant crescent immediately before and after the annular phase. Refractors of good quality are favored here since any internal reflections will lower the contrast or even obscure the prominences or corona. It should prove interesting to see if anyone accomplishes a similar feat during 1998's annular eclipse. A full report Eclipses During 1999 will be published next year in the Observer's Handbook 1999. Details for the 1998 February 26 total solar eclipse have been published by NASA (see: NASA Solar Eclipse Bulletins). 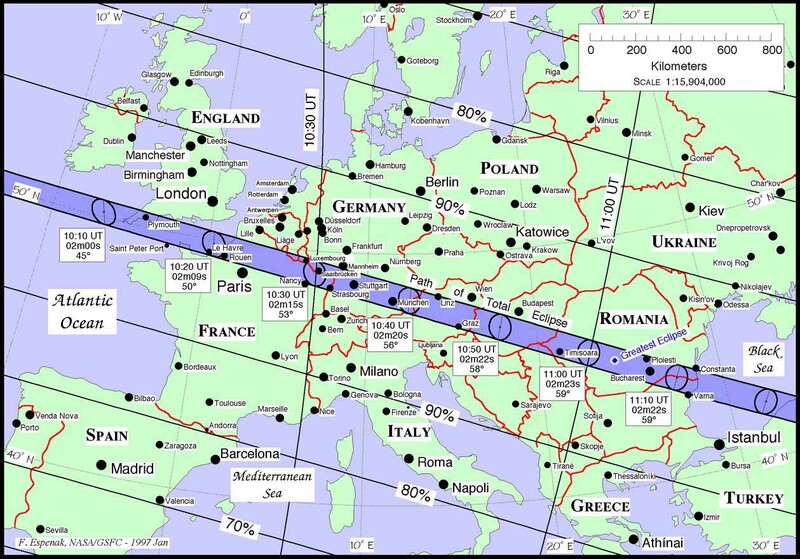 Excitement is already building for the total solar eclipse of 1999 because it crosses central Europe during mid-summer. Among the countries in the path are England, France, Belgium, Germany, Austria, Hungary and Romania. Greatest eclipse occurs in Romania where totality lasts 2 minutes 23 seconds. The path also crosses central Turkey, the Middle East, Pakistan and India. Additional information can be found at a special 1999 total solar eclipse web site. The most detailed predictions are available in the on-line document NASA RP 1398 - Total Solar Eclipse of 1999 August 11 [Espenak and Anderson, 1997]. This report is also available in hard copy form (see: NASA Solar Eclipse Bulletins). All eclipse predictions were generated on a Power Macintosh 8500/150 using algorithms developed from the Explanatory Supplement  with additional algorithms from Meeus, Grosjean, and Vanderleen . The solar and lunar ephemerides were generated from Newcomb and the Improved Lunar Ephemeris. As in previous years, the author uses a smaller value of k (=0.272281) for total and annular calculations than the one adopted by the 1982 IAU General Assembly. This results in a better approximation of Moon's minimum diameter and a slightly shorter total or longer annular eclipse. The IAU value for k (=0.2725076) is retained for partial phases. For lunar eclipses, the diameter of the umbral shadow was enlarged by 2% to compensate for Earth's atmosphere and the effects of oblateness have been included. Text and table composition were done on a Macintosh using Microsoft Word. Additional figure annotation was performed with Claris MacDraw Pro. Espenak, F. and J. Anderson, 1996, Total Solar Eclipse of 1998 February 16, NASA RP-1383, Washington DC. Espenak, F. and J. Anderson, 1997, Total Solar Eclipse of 1999 August 11, NASA RP-1398, Washington DC. Espenak, F., 1996, "Coming Attractions: A Solar Eclipse Sneak Preview", Sky and Telescope, 92, 2, 48-51. Fiala, A. D., J. A. DeYoung, and M. R. Lukac, 1986, Solar Eclipses, 1991-2000, USNO Circular No. 170, Washington, DC. Improved Lunar Ephemeris 1952-1959, 1954, U.S. Naval Observatory, Washington, DC.